Woke up in Lomas with no real desire to dawdle. A rooster started crowing around 3:30AM and I was awake (I thought incontrovertibly) by 5AM, but I managed to get back to sleep until the alarm went off. Packed quickly and had our stuff loaded on the bikes by around 8:20AM… but the woman who owned the hospedaje was nowhere in sight. And she had Kay’s passport, which she was holding as security against the room. Another family was leaving at the same time as we were getting ready, and the woman knew where the owner of the hospedaje was (apparently she owns a shop, too, a couple of blocks away) and showed Kay where to go find her. A few minutes later, Kay comes back and says “she’s coming,” and a few minutes after that, she shows up, grabs Kay’s passport from somewhere inside and waits for us to ride off. 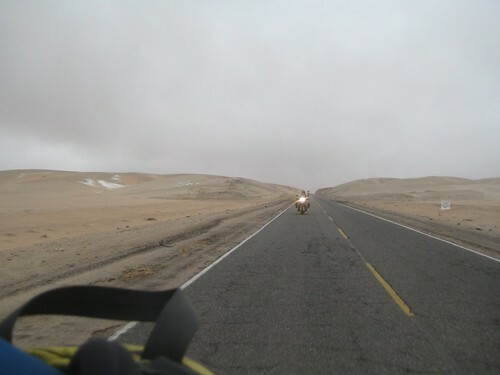 It’s around 8:40 when we hit the road, and just before 9AM when we return to the Pan Americana. We were both hoping to make some good progress today. We’ve had so many delays lately, and I was paranoid about my tire (which had deflated to around 26 PSI when we checked it before we left this morning – had to add more air) so I just wanted to push on. We were hoping to get as far as Ariquipa, and then make for Bolivia tomorrow. 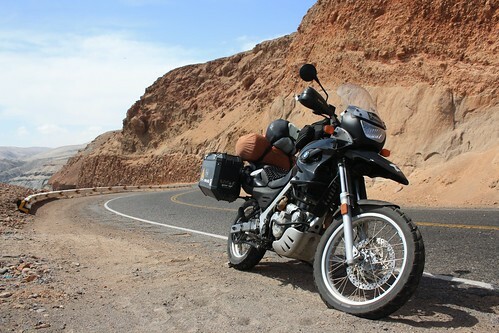 Rode hard in the AM on the long, flat, straight desert roads, but after an hour or so, the road changed. There were hills, and then mountain spurs, coming right out to the coast. It was back to riding up, down and sideways on twisty mountain roads. Granted, the landscape was still spectacular – desert mountains on our left and the South Pacific (yes, we’re far enough south that it’s the South Pacific now!) on our right. The road surface took a turn for the worse, with bumpy, holey tread – almost like they’d stripped the top of the road surface off and we were riding on the part that’s under the smooth asphalt. It was wreaking havoc on my mental state, as the tires felt weird on this road surface, and I was still paranoid about my rear tire. The last thing I wanted was to change the tube and deal with a flat yet again. Whilst I was busy focusing on my tire, Kay led the way and hit a bump that caused the spare tire he’s carrying to shift *just* so, and bounce off the top of his taillight cover. Hard enough to knock it off, and cause it to shatter in the roadway. I heard a “I need to pull over” and panicked a bit, because Kay never needs to pull over… and he explained what happened. The light was still intact, but the red plastic cover over the light was lying in the roadway in far too many pieces to do us any good. So now we had to find a new taillight cover for Kay, or possibly swap out his taillight assembly. Not too long after this, we rolled into a town with me in the lead again (as I had asked Kay to keep an eye on my rear tire while I was riding) and I spotted a shop that had what looked like moto lights, turn signals, etc. I had my fingers crossed that they’d have a taillight, and told Kay we should turn around and check it out. We did, but unfortunately the only taillight cover they had looked like it was designed for a scooter – it was smaller and there was no way to make it fit on Kay’s taillight assembly. So on we rode. Stopped for lunch at a restaurant/hostel, and had a meal that was barely edible. Kay ended up with breaded, fried chicken, pounded thin, but the breading was QUITE salty and Kay could only eat about half of the chicken. I had carne that was also breaded, which always sounds good but rarely turns out good in practice. I managed to eat all of mine, but only because we’d had no breakfast and no dinner last night, and I knew I needed something to eat. Then we popped next door to buy some bottled water, as we’ve both been having trouble with our intestines and we thought maybe we should give the filter a break and buy water today. I was extra happy that it was cold water – tastes real good in the hot Peruvian desert. Back into the desert. We rode along the coast through more amazing landscape, following the sea and the mountainy bits, and roll into Camana shortly after 3PM. I figure that Camana is probably 3 hours from Arequipa, and as long as we’re fast, we can make it before dark. But Camana is a bigger town, although nowhere near as big as Arequipa, so I suggest we should look here for a new taillight cover for Kay. Arequipa is virtually guaranteed to have something, but it looks quite big on my map, and I don’t fancy riding around a big city looking for a moto shop hoping to get lucky. So we stop and ask a cop in Camana if she can recommend a moto repair shop, and she tells us to take a left, ride two blocks, and take a right. We do, and we end up at a repair shop that is currently servicing a couple of moto taxis. Kay asks about a taillight, and the guy immediately dismisses him. “No, we don’t have that. You’ll have to go to Lima for that.” He clearly didn’t realize that we were no longer running the stock BMW taillight (I think the one they put into the bike in Colombia was a Yamaha assembly, although it might have been even more generic than that) but Kay explained that it doesn’t have to be BMW, that it doesn’t have to look pretty – he’s just looking for a new taillight assembly. The guy goes back into the shop, and comes out a minute later with one of the small taillight covers we’d seen at the moto shop earlier today. It’s not big enough to fit into the assembly properly, but he indicates that shouldn’t be a problem. All we need is a couple of long screws and we can rig something up. 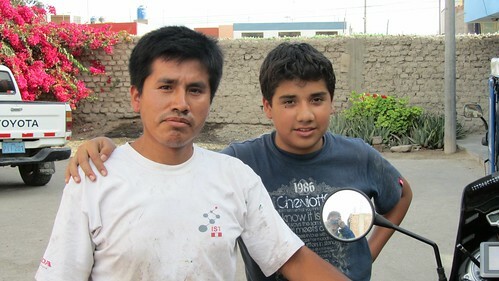 So he sends Kay off to a ferreteria (hardware store/shop which is also occasionally a workshop) and a kid who has been hanging out nearby on a bicycle offers to ride over and show Kay how to get there. So I stay with the bikes and chat with the locals in my very poor Spanish, and Kay walks off after the kid on the bicycle in search of a screw. Sadly, Kay returns a few minutes later after having visited about five hardware stalls, sans screws. No luck. The guy sends Kay off to another ferreteria, and the kid on the bike leads the way – and four places later, still no screws that will work. Eventually, the guy hops in one of the moto-taxis that he’s repairing, motions for Kay to get in the back, and they ride off in search of screws. This time they find them, and return a few minutes later. The guy wanted long, pointy screws that he could use to “drill” new holes in the taillight assembly to hold on the smaller taillight cover. A few more minutes of work, and viola! Slightly smaller, but still functional, taillight cover. Kay is psyched because it’s small enough that it doesn’t protrude out far enough for the tire to hit anymore, so there’s no way the tire can take this taillight cover out, too. Hopefully. Cost? 5 soles, or not quite $2 US, even with all the running around to find screws. 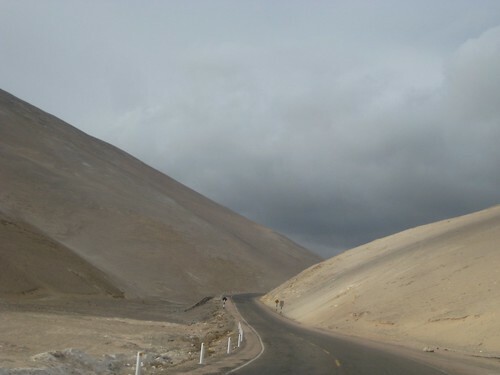 Back on the road, and it’s 4:30 – definitely no time to get all the way to Arequipa. One of the locals I was chatting with said it was 2.5 hours to Arequipa, so if we pushed it, we *might* roll in at 7… but sunset was scheduled for 6:18PM, so even with the best case scenario, we wouldn’t make it into Arequipa without riding after dark. So we discuss our options while we ride along, and discover something. Kay mentions camping. Camping is always an option in the back of my mind if we get stranded somewhere between towns, and I actually enjoy camping – there are times when I’d much rather have been in our tent than in some of the annoying hotels where we’ve stayed. But camping here would involve riding out across the desert itself to get far enough off the road to camp safely (without drawing attention) and the sand is deep. I have ZERO desire to ride through deep sand to find a camping spot, particularly if I’m not stranded for some reason. I’d deal if I had to, but if it’s not essential, I’d rather not ride in sand. I just don’t have the skill to deal with it. This starts a massive argument, and we both get unhappy. Kay suggests that we strike out on one of the roads that is crossing the sand, if I’m not willing to ride on the sand itself – but I look at the roads we’re passing and I think they’re all covered in sand. 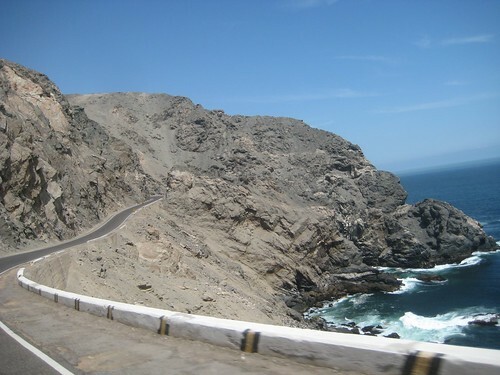 I haven’t seen a decent road heading off the Pan Americana since the road we took to Lomas. I try to explain that I have no problem with dirt, but the dirt roads we’re likely to encounter out here in the middle of the desert are probably covered in sand. Hell, even the paved road is covered in sand in stretches. So I’m not willing to take that chance unless I have to. Kay is disappointed, and we go back and forth over what I would find acceptable. I can tell he believes we’ll never camp on this trip, and I’d be disappointed if that were true, but I’m not willing to ride beyond my skill level just to accommodate him. And he’s upset that he thinks we’ll never camp, because when we left, we’d planned to camp all the time. So more arguing ensues, and we’re both unhappy, and it’s getting later. I point out that I’m not willing to forego dinner tonight – I didn’t eat dinner last night, nor breakfast this morning, and I need food. Camping would involve skipping dinner, because we’d have to camp in the middle of the desert to do it safely. No restaurants there. Kay says we could stop to get food first, but it’s already well after 5PM, and I don’t believe there’s time to stop and have dinner, and then look for light. I point out that if we want to camp, we have to lose more daylight – we’d have to stop and get dinner by 4:45PM in order to have any remote chance of camping, so we’d lose an hour to an hour and a half of riding time every night if we camped. And I’m feeling very crunched about the schedule, so this doesn’t make me happy. In the end, nothing is resolved and we’re both unhappy. Just at sunset, we roll into a tiny town that isn’t even on my map – La Joya. We see a single hospedaje sign, and we stop to check it out. Kay goes in to look at it, and comes back to tell me that none of the rooms have toilet seats and am I willing to deal with that? 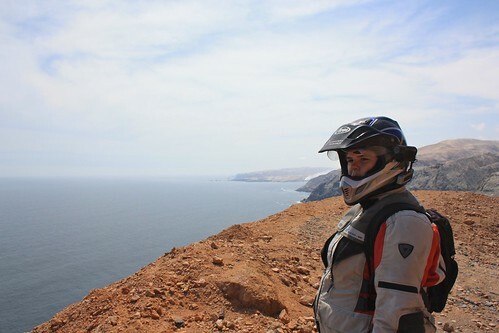 I ask if we have a choice, and we have another argument – about what I’d rather do – ride in the dark to Arequipa and look for a place that would have toilet seats, or stay here and deal with the no toilet seats. More arguing. I say that at least we should check out the rest of the town to see if there’s a second hospedaje that might have better rooms. So we ride down the road, but there’s nothing. Except I see a block of lights a bit further down the road, so we ride there. Nothing. But at this point, I recognize something on my map and see another block of lights down the road, so ask if we can ride there. We do, and there’s nothing. At this point, the town that had the hospedaje is probably 10-15 minutes behind us and it’s full dark. Kay asks if I want to go back and stay in the place with no toilet seats, or ride in the dark to Arequipa. It seems like a no brainer to me. I ask again “Do we have a choice?” thinking it’s obvious that we should go back and stay in the hospedaje. But Kay and I are arguing in circles, and neither of us is communicating well with the other, so we end up sitting on the side of the road in the dark, yelling at each other in the headsets, unable to agree on a decision because we’re both unhappy and the answers I give Kay aren’t sufficient for him. Eventually I just start saying “Whatever you want to do” and refuse to participate in the conversation any further. Frustrated, Kay decides to turn around and head back to the hospedaje, which I thought was the obvious choice all along. We’re both still unhappy. Kay’s note: definitely communications issues, but I think a lot of the problems towards the end of the day weren’t so much a failure to agree on a decision, as much as me trying to figure out which option was least disagreeable to her but failing to get an answer. We still disagree about the details of how and what was actually going down. At the core of this is a recurring communication problem we’ve got to get resolved. Back to the hospedaje, and they have secure parking for the bikes, so we ride around through the alley and pull into the building. The only thing I bother to bring up to the room from the bikes is my bag of cords for charging stuff, because we need to charge the headsets. Normally, I bring up my tank bag and both panniers, but I don’t feel like dealing with anything after our arguments. After taking one look at the room, I resign myself to a miserable night and don’t bother to bring my toiletries, or my laptop, or clean clothes – any of the stuff I usually bring. Kay asks about it but I tell him I just don’t feel like dealing, which is true. Up the hotel room, and I take off my motorcycle gear and lay in bed. Kay asks if I’m not coming out for food, and I confirm, because again I don’t feel like dealing with anything. I’m still upset from our arguments and not happy about the poor quality of the hospedaje (a bed in the room and a single chair, dead bugs on the floor, no toilet seat in the bathroom, no shower curtain, funny smell, etc.) So Kay goes out to find food, and brings back food for both of us. I feel bad for arguing with him, and am grateful he takes care of me even when I’m being difficult. I am very lucky to be traveling with this man, and I want to spend the rest of my life with him. So a night that could have been miserable took a slight turn for the better. Kay watched Law and Order SVU on the TV (English, with Spanish subtitles) and I read. Eventually we snuggled and talked about the arguments and what started it in the first place – the whole camping thing. Still nothing is resolved, but at least we have a conversation instead of an argument. I still don’t like the hospedaje, but we’ll be moving on in the morning so I don’t have to like it. I just need sleep. Tomorrow is a fresh start.